A midweek to New York. My girlfriend always wanted to go back to New York, after she went with her mother more than 8 years ago. She was just a teenager back then, and the city had such a big impact on her, she felt like it had all been a dream. It just didn't feel finished for her. Since I had never been there, I was kind of curious as well. After years of doubt, big expenses on other necessities, or just plain different holiday plans, we decided to go for it nearly 2 weeks ago. My girlfriend had 2 weeks off, and joked about going to New York in her 1st week off. I decided to tell her it was fine by me. After all, why shouldn't we go? After talking about it a bit more, we decided to go for it if I could get some days off as well. Since it was Ascension day, nobody was at the office, so we had to wait until Friday to see if we could go. That Friday I was told I could take the next week off, and we booked straight away! 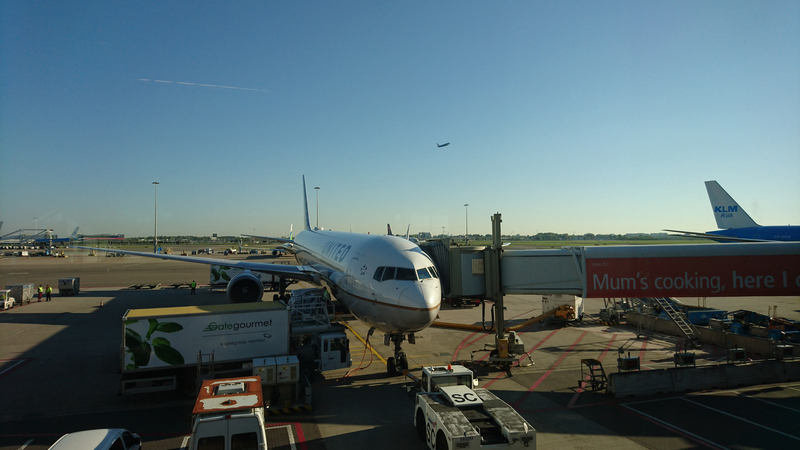 Our flight left from Schiphol on May 9 at 9:15 AM and we would arrive at Newark Liberty International airport at 11:35 AM thanks to the time difference. The flight itself actually takes about 6 hours. When we arrived, we had to go through customs, which always takes up a lot of time. From Newark, we could either take the train/subway, or the bus to New York. We decided to take the latter, since we would be able to see more of the surroundings. Since customs took a lot of time, and the bus took another 30-45 minutes to bring us to New York, we arrived at our hotel at 1:30 PM. Luckily, we could check in right away. Time to dump our suitcases and head into the city! Our first day in New York: Times Square and Rockefeller Center! We were pretty tired at this point. We got up at 4 AM in the morning, but because of the time difference we had a whole afternoon left to see some of the city. 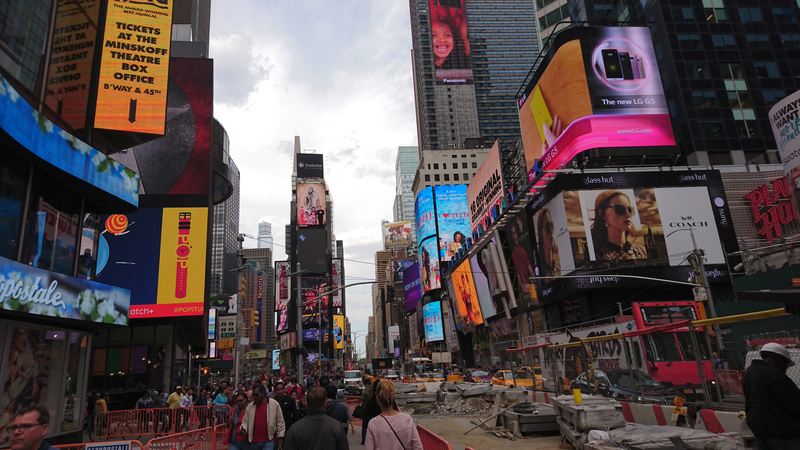 Our hotel was on 42nd street, which led straight to Times Square! Obviously this was going to be our first stop. The city felt hectic already, but then again, we were pretty tired.. We visited the Disney and M&M store, and took loads of photos already. When we felt like we were done here for today, we decided to walk to Rockefeller Center to go and find the LEGO store. This was a must-see for me, as you may understand. We took our time getting there and decided to sit on a bench for a while to gather some energy. When we nearly arrived, another store caught my attention: The Nintendo store. I could not help myself and had to pay this store a visit. It had all of the good Nintendo stuff and a few playable consoles/handhelds. The thing that really caught my attention was the display on the 2nd floor which contained one of EVERY Nintendo handheld ever created. When we finally got to Rockefeller Center, the LEGO store could not be missed. I spent a good amount of time inside, and was pretty disappointed as all the prices were way higher than the online US store. The prices didn't even include taxes, which meant buying them in Germany would be much cheaper. I ended up buying the New York store exclusive "Pick a model" Statue of Liberty, which I managed to fill up with enough blocks for 1.5 Statues of Liberty. The price you pay for the "Pick a model" is outrageous though. It costs $5 and can't hold much blocks. for only $9 you can fill an entire cup, which can hold enough blocks for at least 10 Statues of Liberty, all you really need are the building instructions. 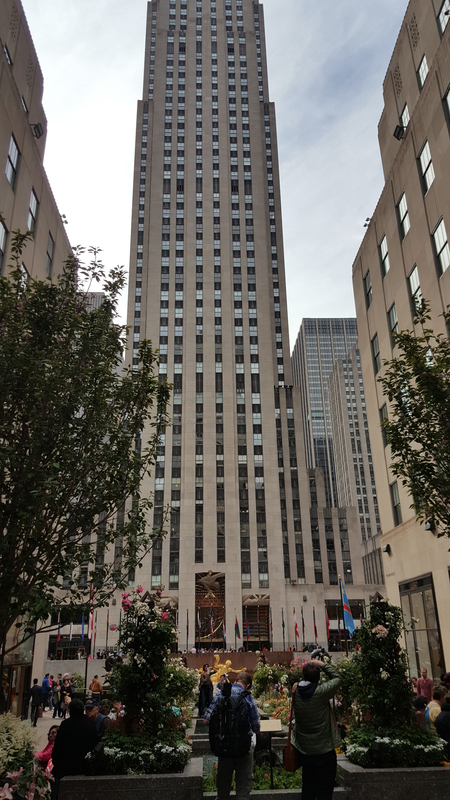 After leaving Rockefeller Center we decided to look for a place to eat. We were both pretty tired, and wanted to sleep early. We ended up in a restaurant where my girlfriend had already eaten before, 8 years ago. It was an Italian place called Bella Vita Trattoria. at 6:15 PM we were already done eating, and went back to our hotel. On the way to our hotel was a small supermarket called The Food Emporium, where we would do our grocery shopping (fresh water, some bread etc. etc.). After a long shower, we went to bed really early that evening. Day 2: American Museum of Natural History and Central Park. We both woke up early next morning, probably because we were still getting used to the time difference. At around half past 9, we were already on the streets of Manhattan, walking towards the American Museum of Natural History. The museum was great! 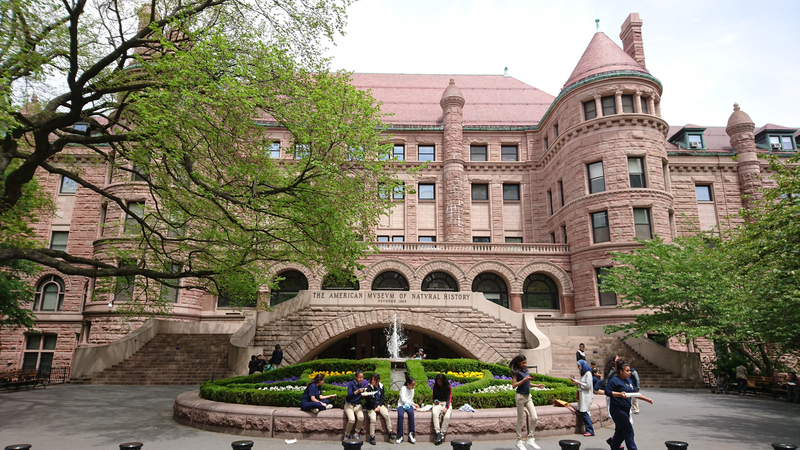 It's the museum that's being used in the "Night at the Museum" movies. You may decide your own admission fee for the museum. If you don't want to pay anything, that's fine as well. They do have a recommended admission fee, which is what we payed. The museum is HUGE, so we didn't visit every room. We did however find some of the icons from the movie, like the Easter island head replica! The room which I was most interested in, was the one with all the dinosaur bones and replica's. Walking around in those rooms was great. You just can't imagine that these beasts roamed the earth thousands of years ago. Some of them were huge. One of them was so big, it did not even fit in the room, so they stuck his neck and head into the hallway. 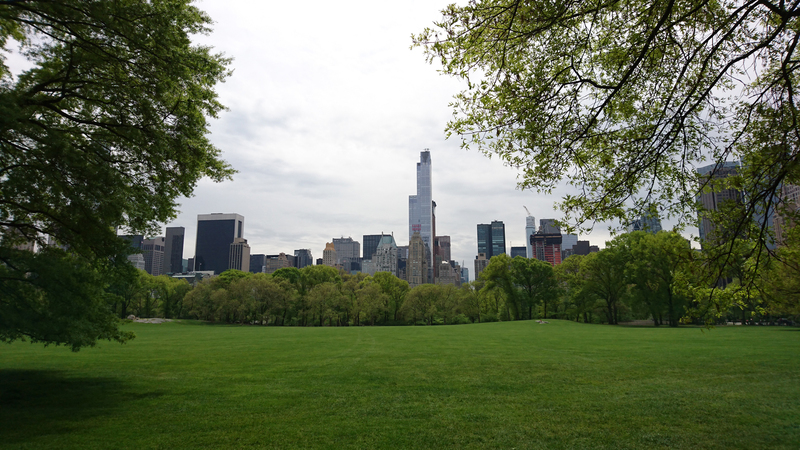 When we felt we were done in the museum, we went to Central Park, which lies right next to it. Our legs were already tired from all the walking, so we found a nice place to sit and decided to chill for a moment. Central Park is beautiful. You can't imagine such a place right in the middle of Manhattan. It's quiet(er) and has loads of birds, joggers, and other people who fled from the busy city. If you need a moment of rest, which I guarantee you will sooner or later in a city like New York, this is the place to go. It's also probably the only place with grass in mid and lower Manhattan. After sitting we walked almost halfway through the park, before we went back to the busy streets. We went to a diner and ate some American pancakes with syrup, eggs, bacon and a sausage. Since it was still early in the afternoon, we had plenty of time to visit some other places. When we went to Orlando, Florida in 2014, we found this shop which we both really liked called Hot Topic, and the closest one here was in a mall in Queens, so we decided to go there. We used the subway since our legs/feet would not survive any other long walks that day. Turns out using the subway is really easy, and it didn't take us long to get there at all. After our visit to the mall, we went back to Manhattan to eat at the Theatre Row Diner, but not before buying our cat an "I <3 New York" food bowl. We went to bed early once again. This morning we decided to take our time and rest some more, before leaving the hotel. We hoped that we were fit enough to be able to see Times Square when it was dark that way. At around 11 AM we left the hotel, and took the subway towards the World Trade Center. When we got out of the subway, we did not even see the new One World Trade Center (or Freedom Tower) because of all the skyscrapers. We got there eventually though. Funny thing is, it seems as though the tower is not completed yet. It looks like they finished the higher parts of the tower first, probably to ensure it looks finished on the skyline. the lower parts look like they still need some work, and a lot of work is still being done around this new skyscraper. 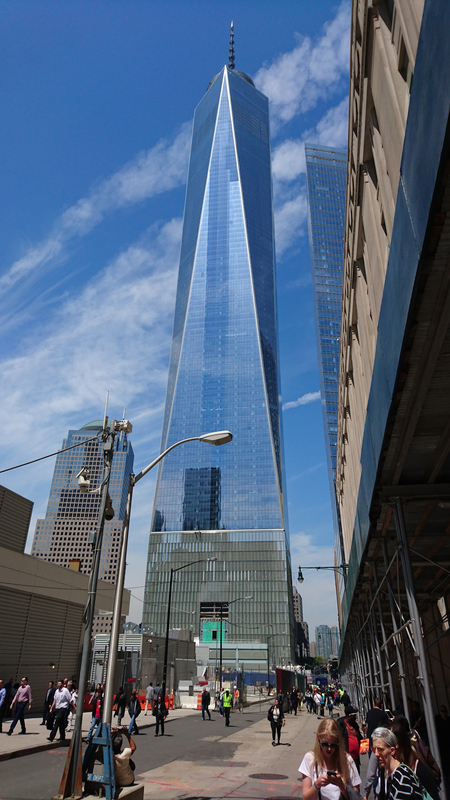 The memorial is located next to this skyscraper, on the exact location where the Twin Towers stood. The memorials itself are beautiful. 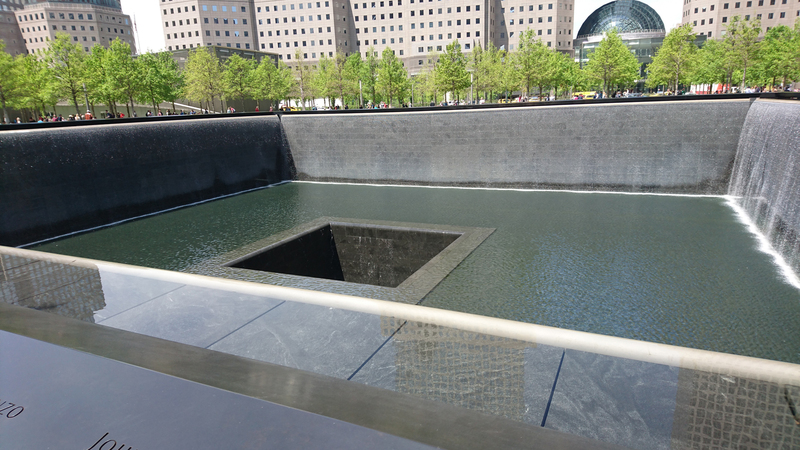 2 enormous gaping holes with water falling from all sides, encased with steel plates with cut out names of all the victims that died that day. The sound of the falling water sets the tone for the atmosphere that hangs around these places. It gives me shivers, thinking so many people died right there almost 15 years ago. Eventually, we decided to go towards Wall street. 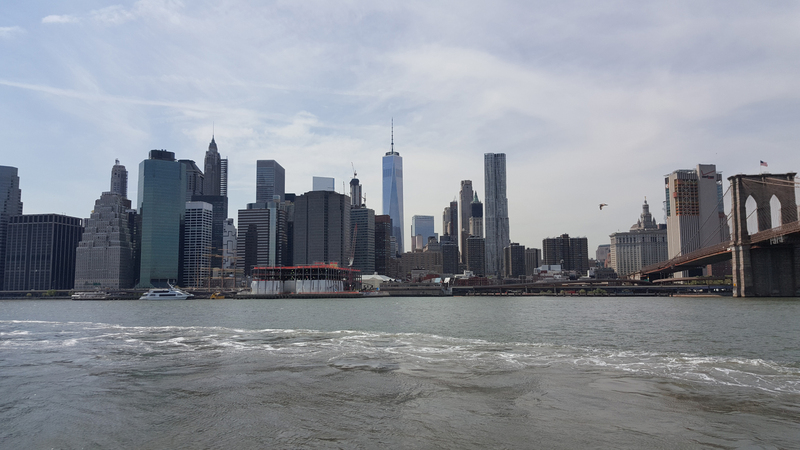 We wanted to see the Brooklyn Bridge, and Wall Street would lead us straight to the water, from where we could gaze upon the bridge. We ended up on the FDR Drive, and even though the view of the Brooklyn Bridge wasn't that great from here, it was nice to stand next to the water! It really gave us both the feeling of a beach vacation in a foreign country, probably because the weather was really nice as well. We ate lunch at this place called Industry Kitchen. From there we could see a bunch of helicopters taking off and landing like clockwork. Loads of tourist fly over New York, apparently. When our bellies were filled, we headed over to Brooklyn, to see if we could get a better view of the Brooklyn Bridge, and maybe get a nice picture of the skyline as well. We could have taken the ferry, but the subway was much cheaper, so we took that instead. Once we got out of the subway in Brooklyn, it was a pretty long walk towards the Brooklyn Bridge Park, but it was definitely worth it. If you looked closely, you could even see the Statue of Liberty from here! 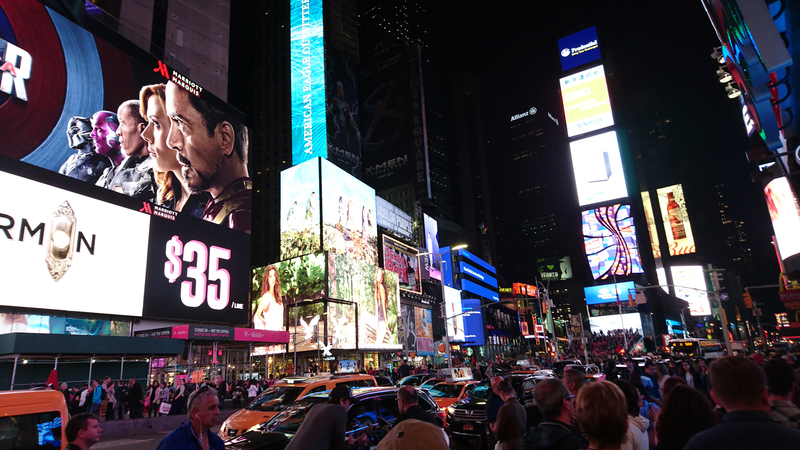 Since we wanted to see Times Square when it was dark outside, we still had plenty of time left. We already checked what movies the Regal Cinema near our hotel was playing. Captain America: Civil War ruled the boards, but we had already seen that movie. Zootopia was still playing here though, and we both really wanted to see that one. The movie is really funny and I would recommend it to everyone! It has some nice plot twists as well. When the movie was done, it was slowly getting dark outside, so we decided to go and eat something first. We didn't really eat much fast food yet, and I felt like we couldn't leave New York without a visit to MC Donalds. The menu there was pretty limited though. Here in the Netherlands we have a way bigger menu to choose from. Nonetheless, it filled our bellies AND it was finally dark outside. As dark as it was going to get anyway. We went to Times Square and it never seemed more alive than it did right then. People were still shopping, taking pictures, cars were honking and it seemed even more crowded than it was at daytime. We took some pictures, went to the Disney store one final time, and called it a day after that. Day 4: Grand Central Terminal and 5th Avenue! This was going to be the final day where we could really go out and see stuff, and we had just 2 more things we really wanted to do: Visit Grand Central Terminal, and go shopping on 5th Avenue. Our first stop was going to be Grand Central Terminal, but on our way there we walked right into the HBO Shop! I just had to pay a visit before continuing to Grand Central Terminal. There was some merchandise for other series, but the Game of Thrones stuff took almost all of the space. I eventually left without buying anything, but they did have a lot of funny stuff! There was this book filled with information on all characters that died in the series, up until season 5. Every character had 2 pages, where the first page would contain a photo, and the second one contained some information on the character. It was a pretty thick book.. 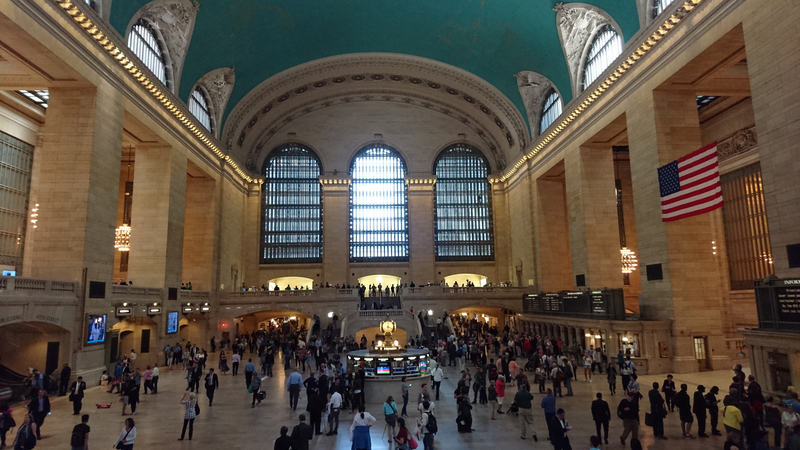 When we arrived at Grand Central Terminal, we wanted to go to the main concourse. Turns out Grand Central Terminal really is grand. we found the main concourse eventually though. Grand Central Station itself is a beautiful building, and it looks really clean from the inside as well. The main concourse was filled with people, and the balconies on both sides were filled with tourists that were taking pictures of the concourse, just like we did. The roof has some drawings of constellations. Unfortunately they are getting a bit vague. The concourse still looked great though! Next up was 5th Avenue and shopping. 5th Avenue was actually really close to Grand Central Terminal. It's also REALLY long with 6.62 Miles or 10.65 KM, but there's another eye catcher near the Grand Central Terminal on 5th Avenue: The New York Public Library! We didn't go inside, but the outside looks great. We did throw some pennies in the fountain next to the entrance. Let's hope our wishes come true. We went south first, and walked through the Manhattan mall, which was kind of a disappointment, since it's really small. We payed a visit to the GameStop and a Toys"R"Us Express, but did not buy anything. When we got outside again, we saw another, bigger GameStop, and after a bit of doubt, decided to take a look anyway. Good thing too, since we got an unexpected surprise there. This GameStop had a basement, but it was closed for public. We asked why it was closed. Turns out a ThinkGeek store was opening there the next day. We had never heard of ThinkGeek before, but it sounded cool enough. After hearing we had to go home the next day, we got access to the store! 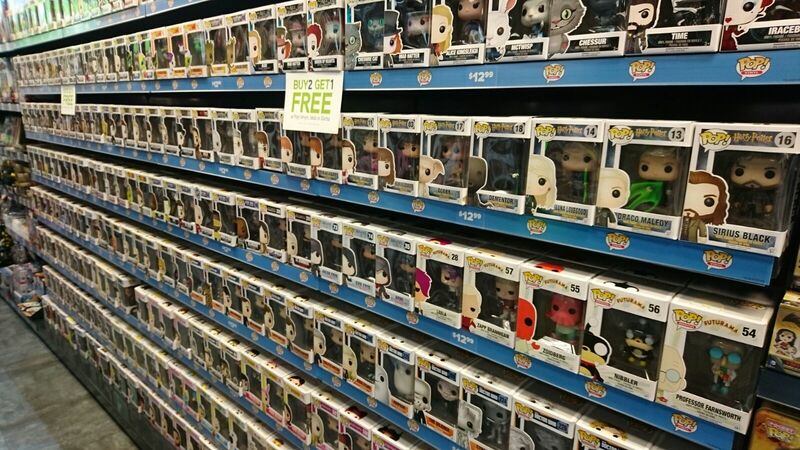 ThinkGeek is a store with loads of Game, movies and series merchandise. The store was completely free of people, except for the few store employees that got some training for the grand opening. We could buy anything we wanted to, and we spent a good amount of time looking for the coolest merchandise we could find. We spend a good amount of money there, and received a limited pin as well. This was definitely the best store I've come across in our time in New York. After visiting that store we went north again, still walking on 5th Avenue. We ran into a shop that sells christmas stuff all year round! It was crazy. They even had christmas songs on the speakers. We then went on to visit Barnes & Nobles, which had some POP figures as well. I ended up buying Deadpool and Ichigo (from the Bleach anime) there. Because of the heavy bags with all of our bought stuff, we went back to the hotel before going to a restaurant. The restaurant we went to this evening wasn't good at all. We had a dish with chicken, and a dish with noodles. The noodles were not what I expected, but at least they had some taste to it. The chicken was really dry. To make things worse, someone spilled a big glass of cold water on my girlfriend. We didn't finish the food, but they still dared to ask for a tip! I had to explain to them why I wouldn't give any tip, even though we were only in there for like 15 minutes, and only ate half of our meals. The restaurant was called Siri Thai Restaurant, and that's a place we will never go back to. We wanted to go to "Top of the Rock" that night, which means you get to the observation deck of the building on Rockefeller Center. By the time we got there (9:15 PM) all the tickets for the rest of the evening were already gone. The observation deck closes at 12 AM, so even if we did manage to get tickets, it would have been a long wait. It was a bit disappointing that all of the tickets for that evening were already gone that early, but it was our own fault for not getting tickets in the afternoon already. We went back to the hotel for a good night's rest instead. This was going to be our last day of our vacation in New York. We had to check out of the hotel at noon, so that's pretty much what we did. Our flight was scheduled to leave at 6 PM, but because we had to be at the airport 3 hours in advance, we had to take the bus at 2 PM already. There wasn't much else we could do today, except for waiting. The weather wasn't as nice as the rest of the week either. The forecast predicted some rain, and it would be a lot colder than the rest of the week. 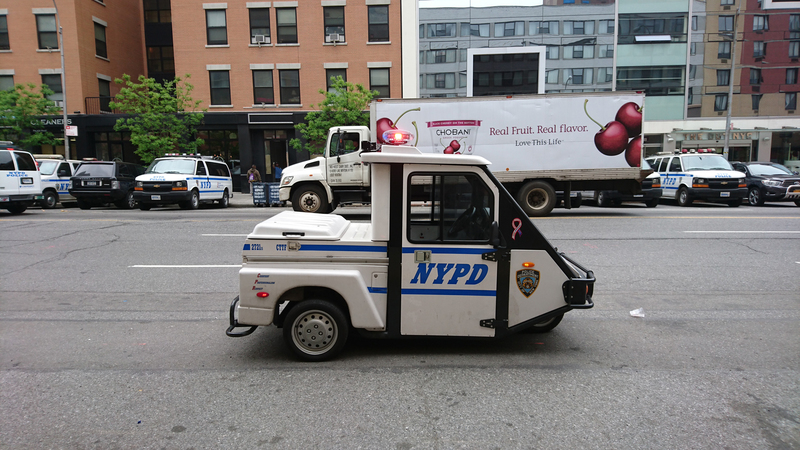 We ate our breakfast in the diner next door, which is actually linked to the hotel by a garage, when I saw the funniest police vehicle ever! The policeman in it was closing a lane on the road. We would soon find out why. After half an hour, the longest parade I have ever seen walked through the streets of New York. All of them were Chinese, and they were asking attention for a think called Falun Gong. Apparently, it is forbidden in China since 1999, and people get arrested and killed by the government if they still do it there. The parade itself was really long with some dancers, music and signs with people who were killed over it. The police was trying to make it all work, without disturbing traffic too much, but they failed miserably. Every intersection was blocked with cars that in their turn, could not go anywhere. The parade caused a major traffic jam in the entire midtown section of Manhattan. The parade lasted for what felt like ages. We joked about it's unending length, and were proven wrong quite some times when we told each other it ended. More people just kept showing up in the back. When we had to leave to catch our bus, the parade had only just ended. I think it lasted for nearly 2 hours. The bus driver was cranky about it as well, as he had to go through the entire traffic jam and people were complaining they would miss their flight if he didn't hurry. Since a bus leaves for the airport every 15 minutes, and we had the last stop before going out of Manhattan, we didn't notice any delay at all. The bus driver was clearly in a hurry though, and he made many cars honk he rushed his way to the airport. After checking in, we didn't have any seat numbers yet, so we went to the check in desk when boarding was starting, and got our seats assigned to us. The plane was pretty full, so we both got a free upgrade to Economy plus, which means as much as sitting next to the emergency exits, with no one in front of you. We could sit next to each other, but the only downside was that the walk lane was in between our seats. The extra leg space was more than welcome though! The plane was ready for take-off at around 6 PM, but there were some problems with the computers in the tower, which prevented us from actually taking off. 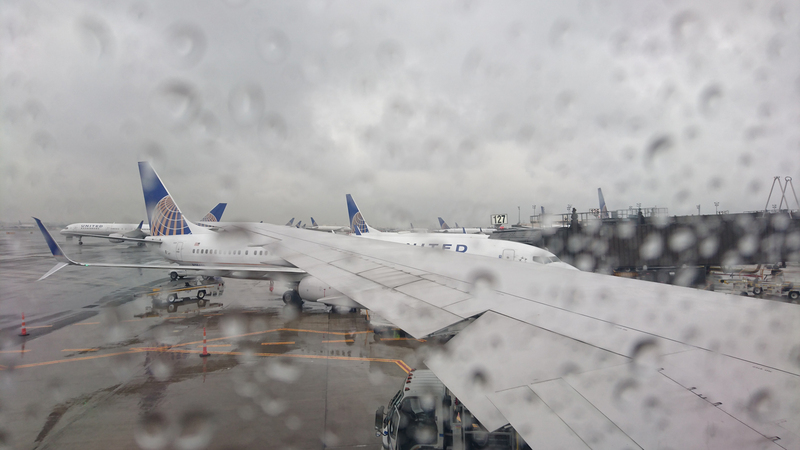 When the computers were finally ready, they noticed our plane was too heavily loaded at the front, so we had to go back to the gate. It was already 7 PM when this happened. At 8:30 PM we finally took off, and were on our way home. This spontaneous trip to New York was something I never expected to happen, but was definitely worth it. All in all, it was an amazing experience, which I recommend to anyone. You should enjoy life, and do the things you want while you still can, otherwise you might be sorry later on.